Mackenzie Madison is the fourth women out of the water in a 1:00:03 - Great swim for MacKenzie today. 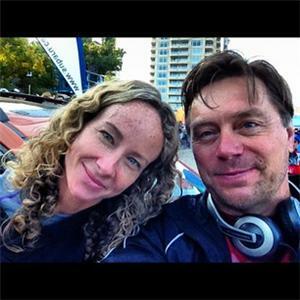 The Bike is a 180 Kilometer single loop course that heads south of Penticton and passes through the towns of Okanagan Falls, Oliver and Osoyoos. 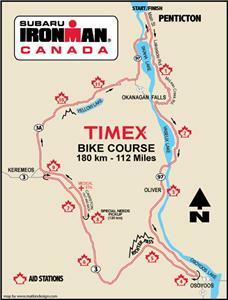 Before entering Okanagan Falls, athletes are forced up McLean Creek Road for a nasty climb for 1.5 kilometers. During the next 45 kilometers participants are going slightly downhill and pass fruit orchards, farms, vineyards, wineries and fruit stands. Those racing know they are in for a world of work as they view the mammoth Canadian flag at the Huskey gas station in Osoyoos. The flag is the symbol that competitors are required to make a hard right hand turn and head up the infamous Richter Pass. The pass consists of an 11 km climb that varies from 4 – 8% in steepness. After Richter Pass, you are greeted to a screaming 6-7 km’s of downhill. In desert like conditions, a number of good sized rollers lead you into the town of Keremeos. You are treated with a brain numbing out and back section that feels like it takes you forever to get out of. This location rarely has wind and can be brutally hot… not something you need at about 120 km’s into an Ironman bike. The last 60 km’s of the bike you are served up some false flats as you exit the out and back section and a couple more climbs that are short and tough, and just come at the wrong time. Many a race plans and goals have been discarded during this section of the bike. The last 20 km’s you are rewarded to some exciting descents where you can take care of your hydration and fuel needs before entering the bike/run transition in town. We should be receiving splits from McLean Creek Road at 16 km's into the bike momentarily. Janelle Morrison swam a 1:06:46 this morning and is out on the bike. 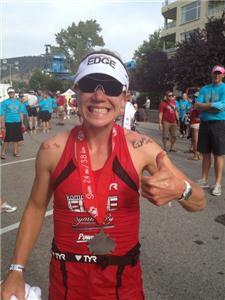 Morrison is making her first Ironman appearance since her horrific vehicle accident in 2010. @xoxbritt1 Live #IMC show starts at 11:30am local time. Back of the packers heading out on the bike. Currently leading the women is Stephanie Ossenbrink (#35) and she has put in some big time on the others over the last 20 km's. Mackenzie Madison has moved into second and move towards the leader as the women's race heads up Richter Pass. Madison biking today is showing she isn't just a one-trick-pony. Her 60-minute swim is a great improvement and with a solid bike today, she could set herself up well to unleash her potent run. 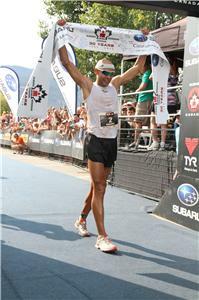 We had 2591 athletes start the 30th edition of Ironman Canada this morning. 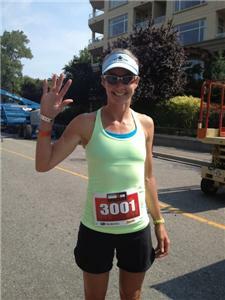 Five-time Ironman Canada champion, two-time Ironman world champion , Lori Bowden getting ready to run. At 14 km's, Bagg has put in 3:00 time gap into Curry. Holtham is 3:20 back, while piggin is 4:37 and Brader has slipped to a deficit of 4:45.
at 6 km's, Ossenbrink's lead stands at 13:00 over Madison. Morrison is only 20-seconds back of second, 13:20 back of the leader. Men at 16 km's has Bagg in the lead with Curry now 3:58 back of the lead. Holtham holds down third (-4:35) and Piggin is in fourth (-4:50). Gillian Clayton made the turn onto Lakeshore Drive and has 2-2.5 km's until securing her first ever Ironman win. Gillian Clayton is our 2012 Subaru Ironman champion. 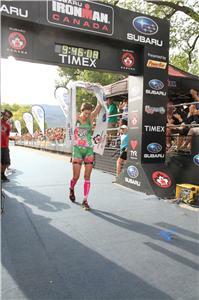 Karen Thibodeau has run her way into a second place showing here at the 30th edition of the Subaru Ironman Canada. What amazing comeback story. Janelle Morrison after surviving a horrific vehicle accident has come back to grab the final podium place here at Ironman Canada.